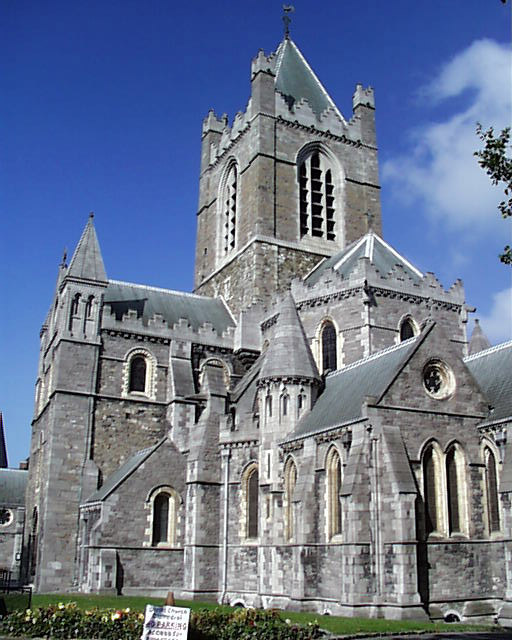 Christ Church Cathedral is the Church of Ireland Cathedral for the Diocese of Dublin and Glendalough. 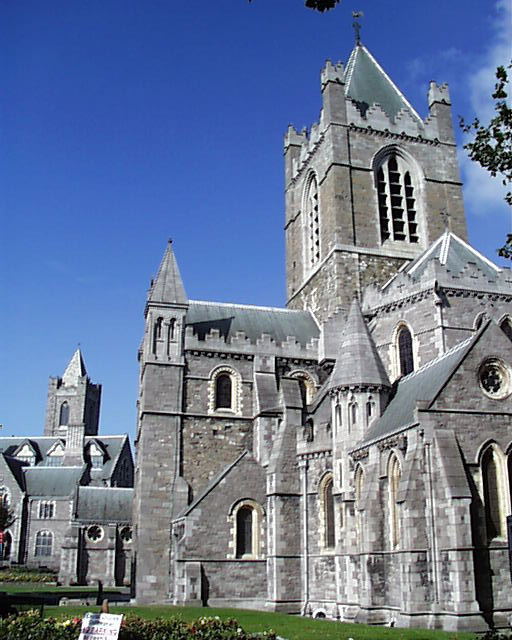 Its origins date to about 1038 when the Viking settlers constructed a cathedral on this site. 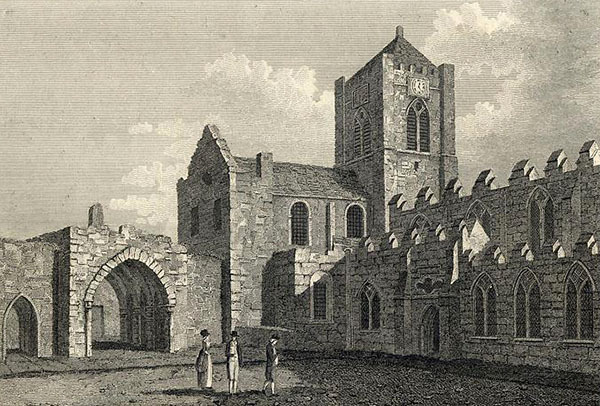 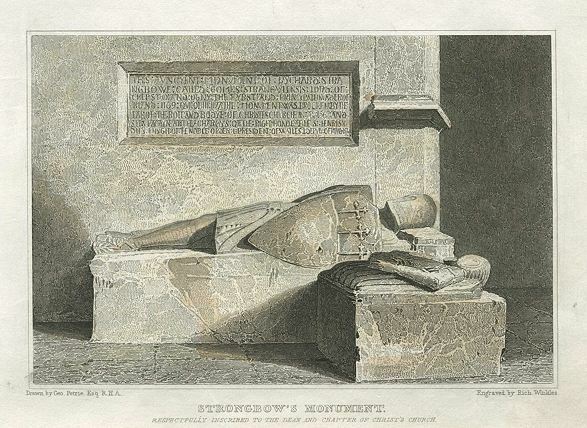 The present building dates to 1172 when Archbishop O’Toole and the Norman knight Richard de Clare known as Strongbow initiated the building work. 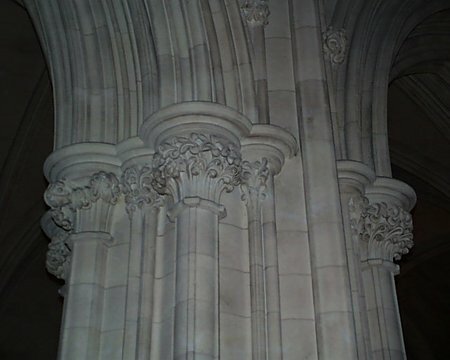 Modeled along european lines, the canons of the cathedral were monks – Canons regular of St Augustine. 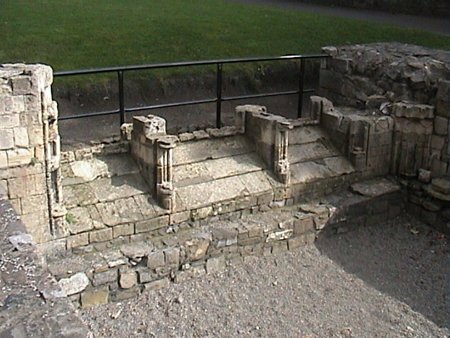 When the church in England broke away from Rome, the majority of the Irish Bishops followed suit and the last Augustinian prior became the first dean. 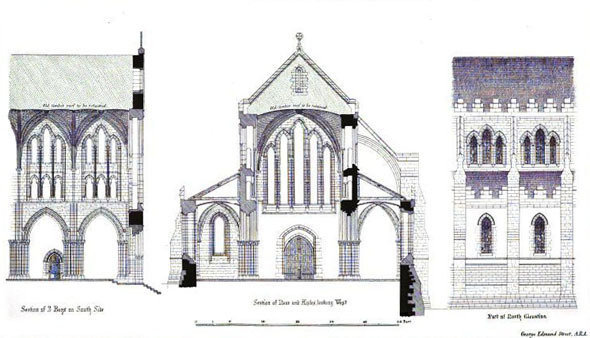 Through the years the cathedral has undergone restorations in 1358, 1562, 1829 and 1871. 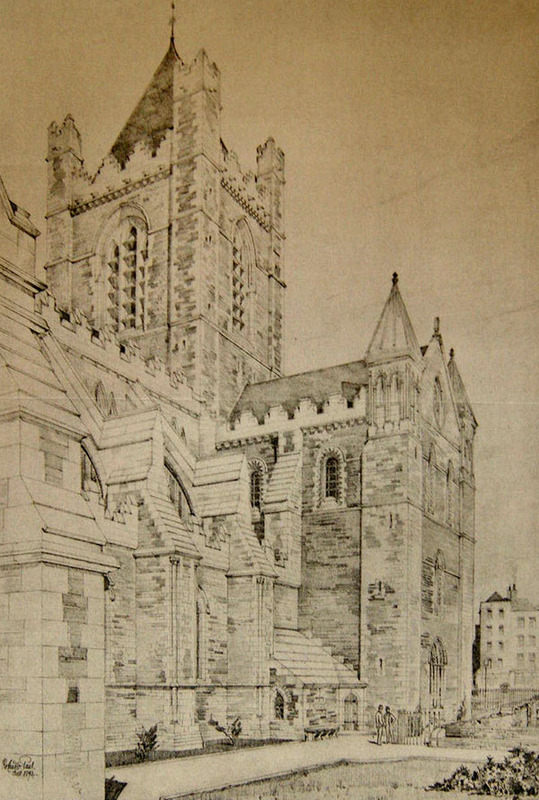 The Cathedral as it exists today is mainly victorian due to the extensive restorations and renovations carried out by the English architect George Edmund Street in the 1870s. 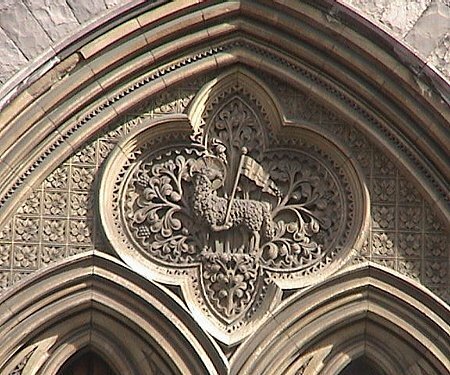 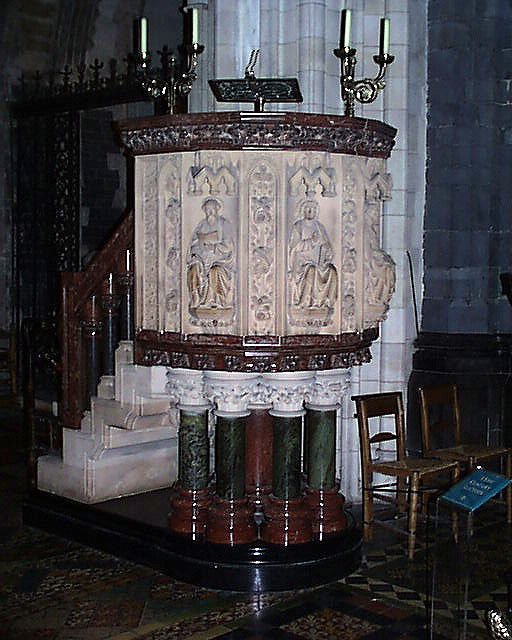 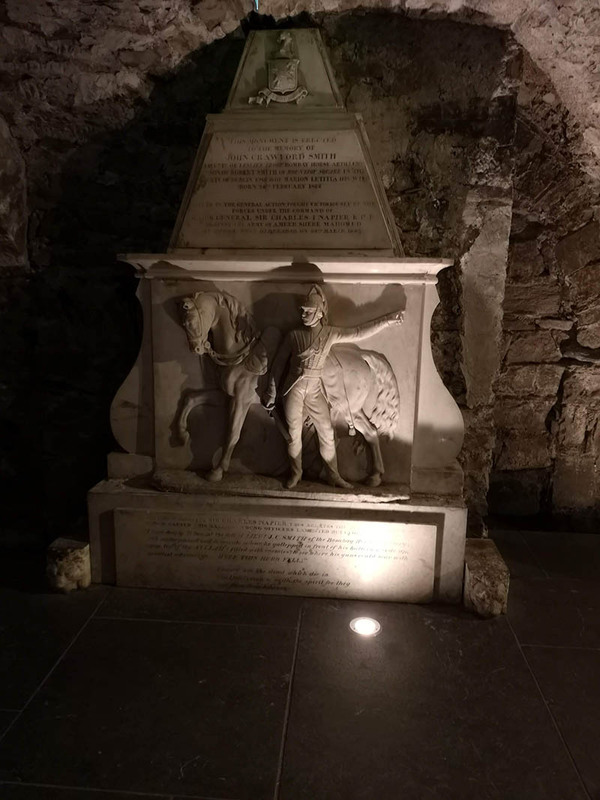 This cost over £230,000 and like the renovations at nearby St Patrick’s Cathedral was funded by a drink manufacturer – Dublin Whiskey Distiller Henry Roe who like Benjamin Guinness generously donated the entire cost. 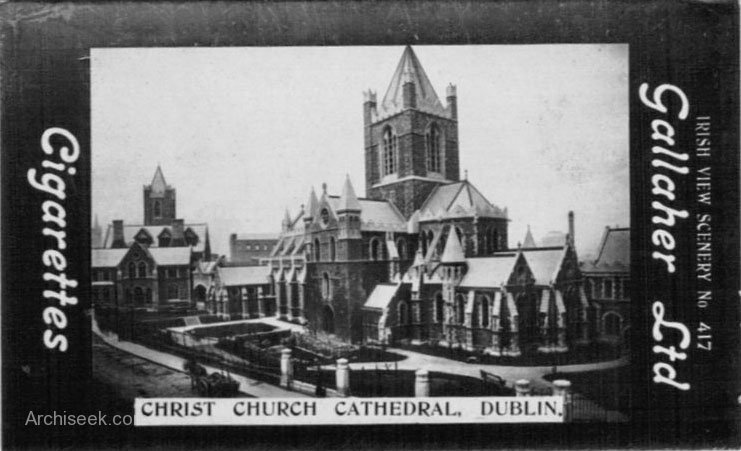 Up until the 1700s houses were built up against the cathedral on all sides and it was not until the Street restoration that the grounds were cleared around the cathedral allowing it to be viewed unhindered. 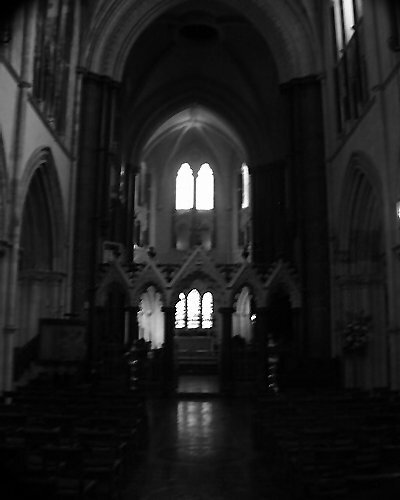 Externally the cathedral seems to wander all over the hillside on which it is built. 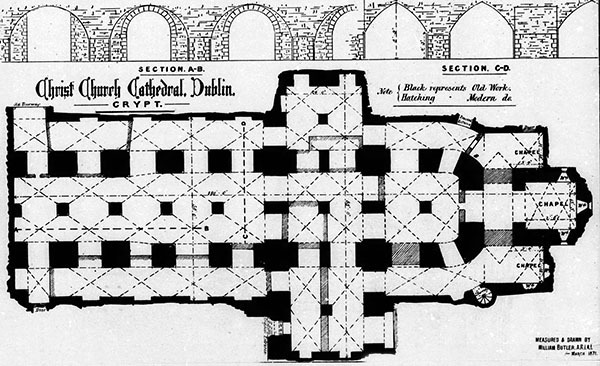 After its initial completion the building was extended lengthwise rather than upwards. 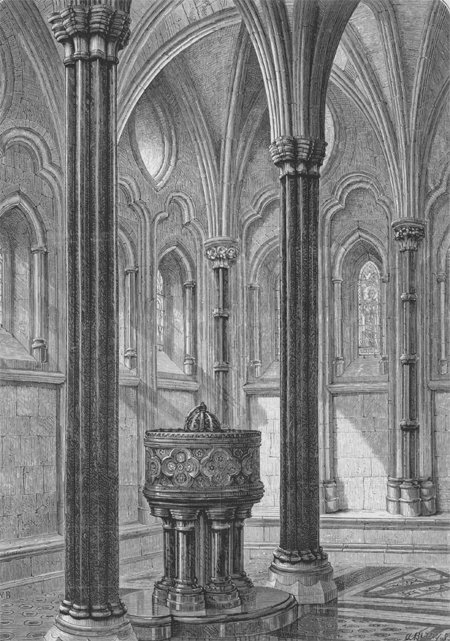 There are remains in the grounds of a chapter house dating from the time it was a monastery church and the original long choir was removed in the 1870s by G.E Street. 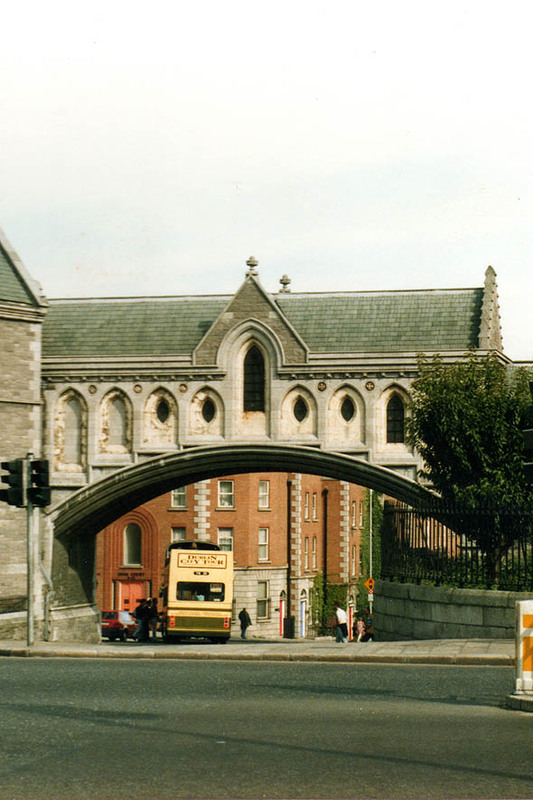 The cathedral is linked across Winetavern Street by a enclosed bridge to the Synod Hall. 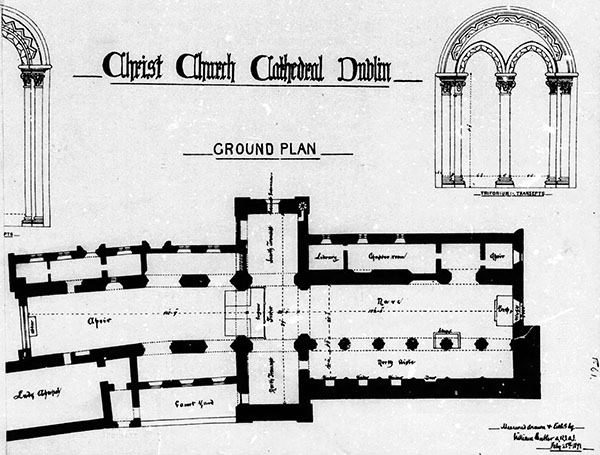 Originally this was a separate church St Michaels and it was connected to the main cathedral in the 1870s. 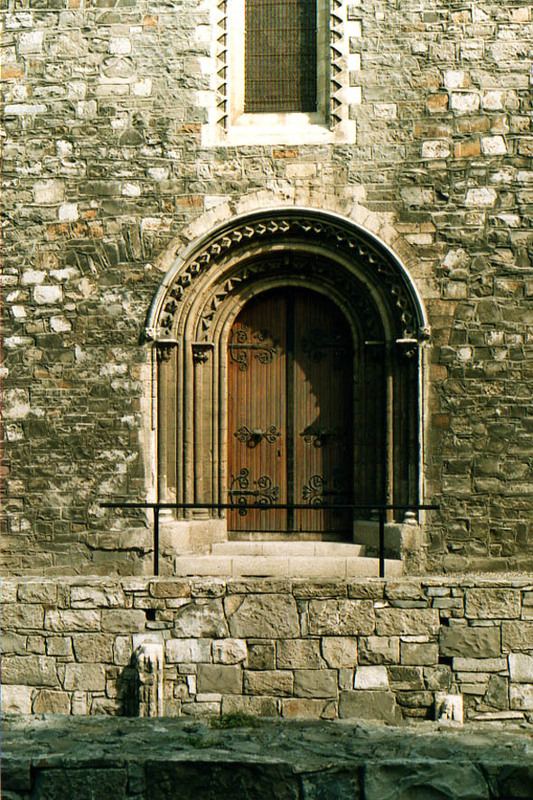 Externally the most interesting feature is the fine Romanesque doorway on the gable of the southern transept. 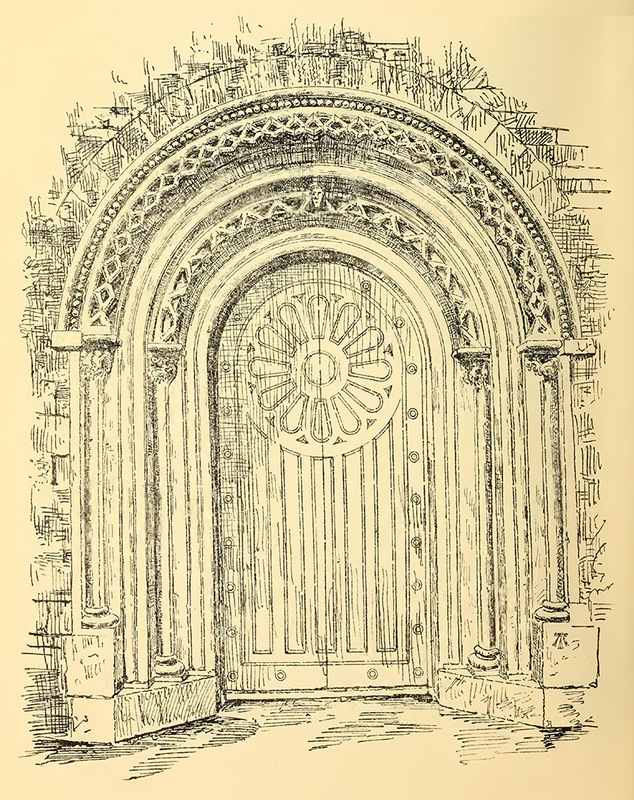 This original doorway dating from the 12th century is one of the view external features not ‘restored’ or replaced by G.E Street, unlike the western doorway. 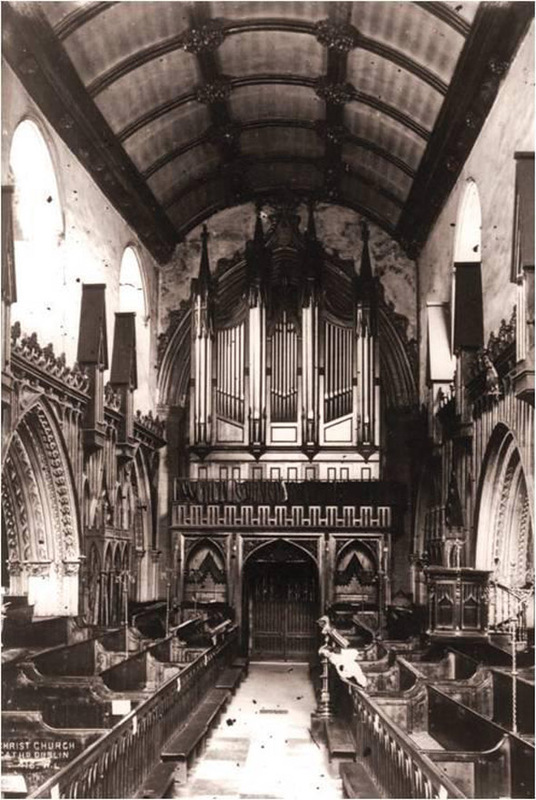 The interior of the cathedral is mainly victorian dating from the restoration. 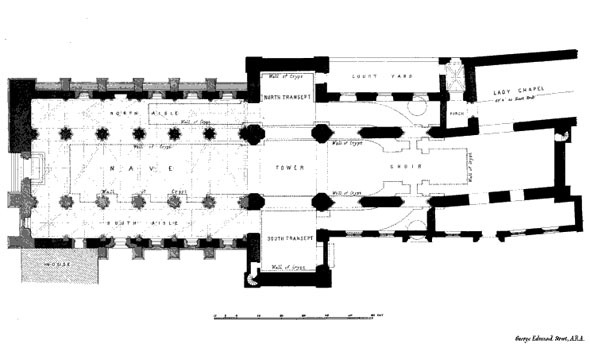 In the plan, the faint dotted line shows the position of the Long Choir demolished by Street and replaced with a smaller apse. 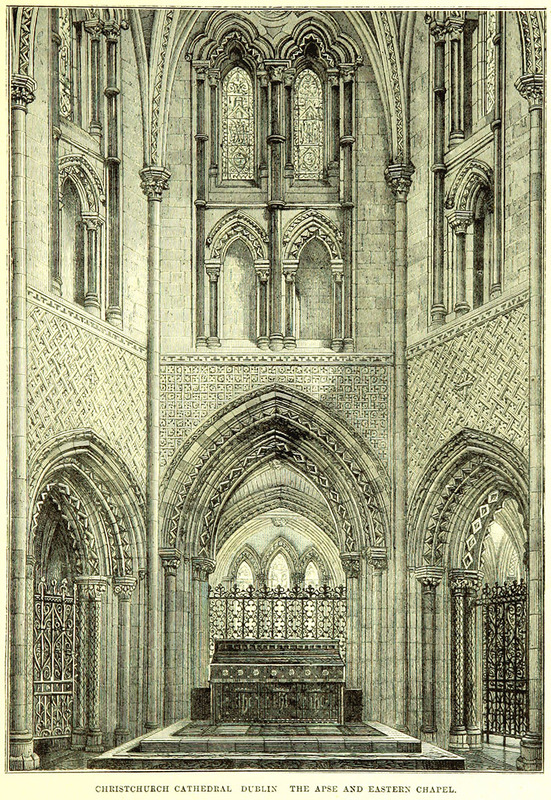 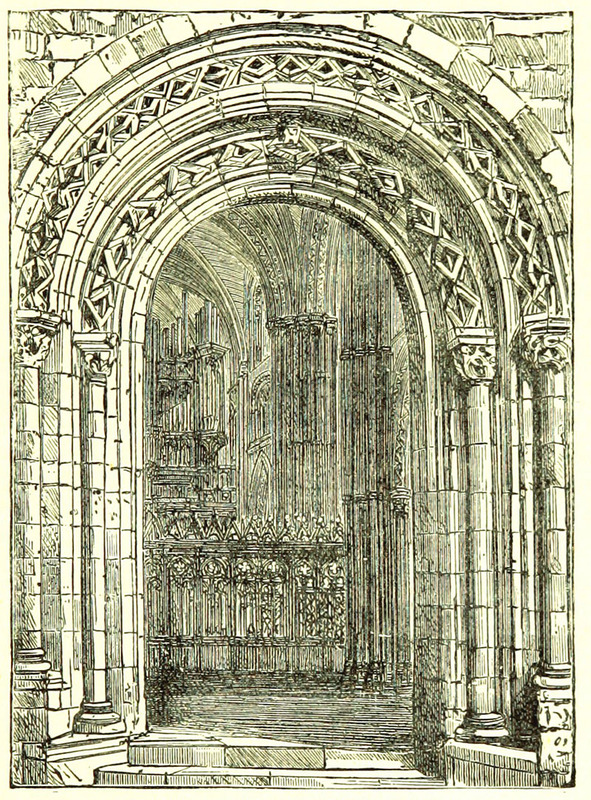 The current sacristy building to the side of the cathedral was the Lady Chapel when the Long Choir existed. 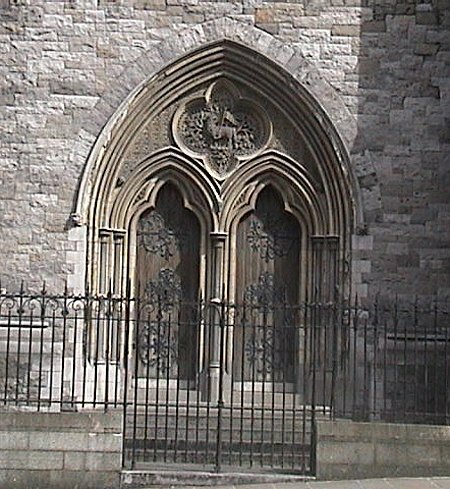 The former chapter house can be seen alongside the transept. 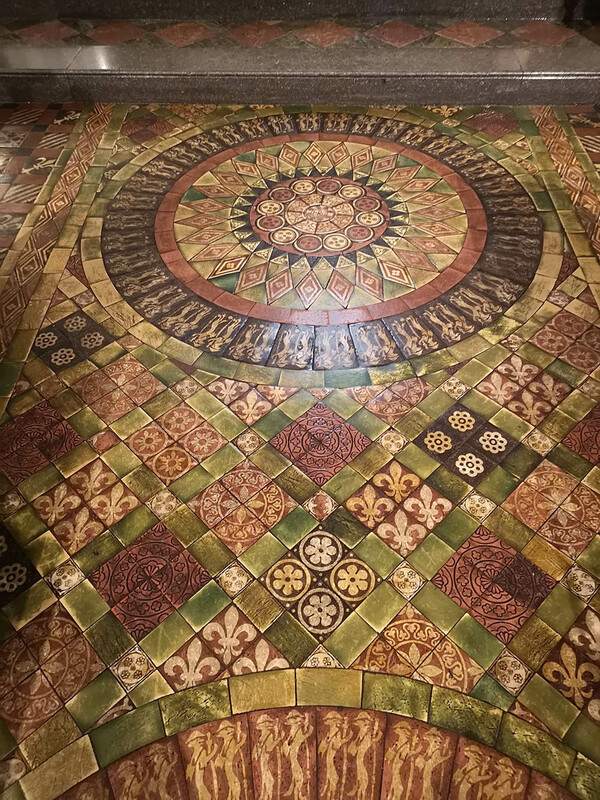 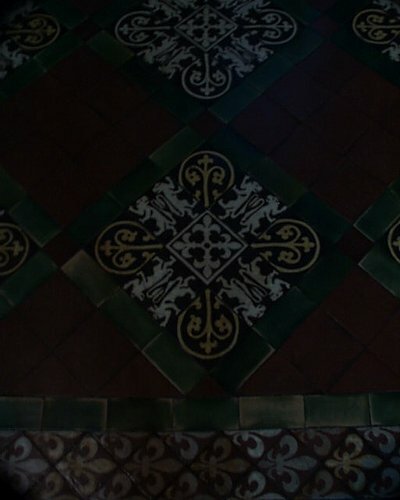 There are many fine victorian features including the floor tiles based on original designs found during the restoration and the many carved surfaces including the pulpit and the columns. 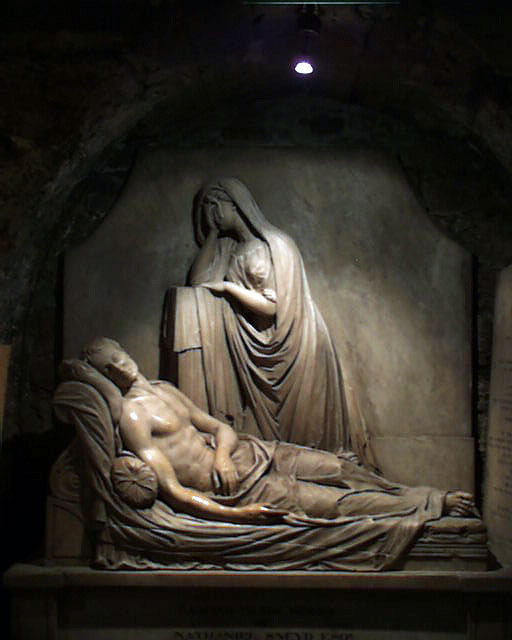 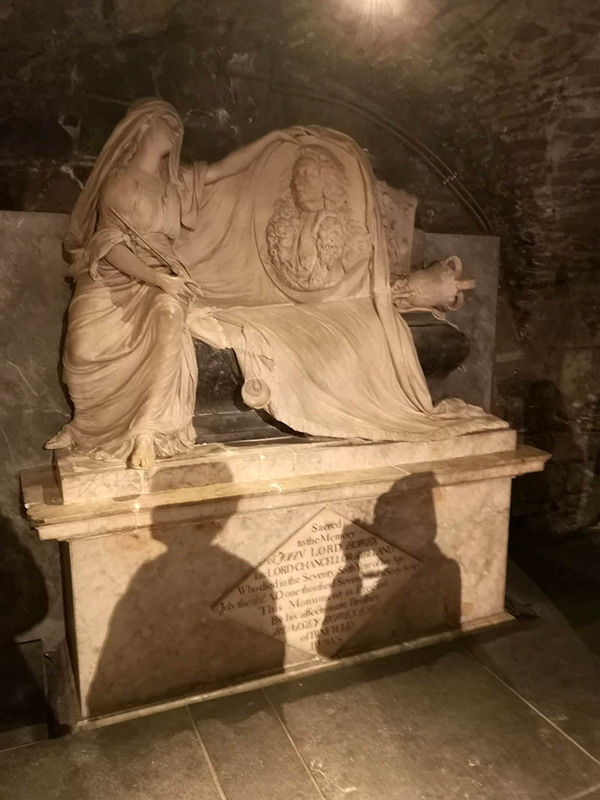 The oldest part of the cathedral is the crypt dating from 1188 which contains many fine memorials and statues. 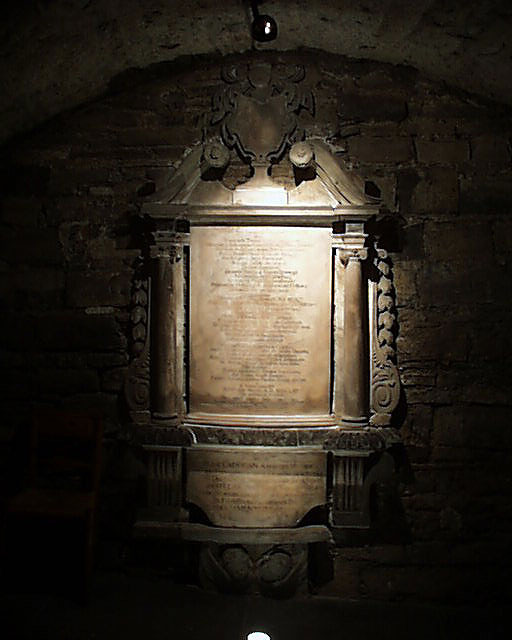 The crypt of Christ Church is the oldest surviving part of the cathedral dating from 1188 and is one of the largest medieval crypts in Britain and Ireland. 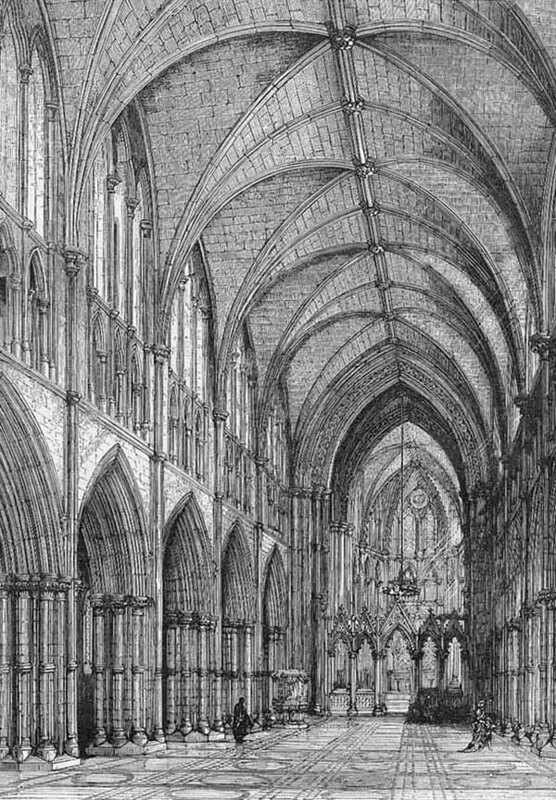 It stretches under the entire cathedral and is 175ft long and a maze of huge stone columns supporting the cathedral above. 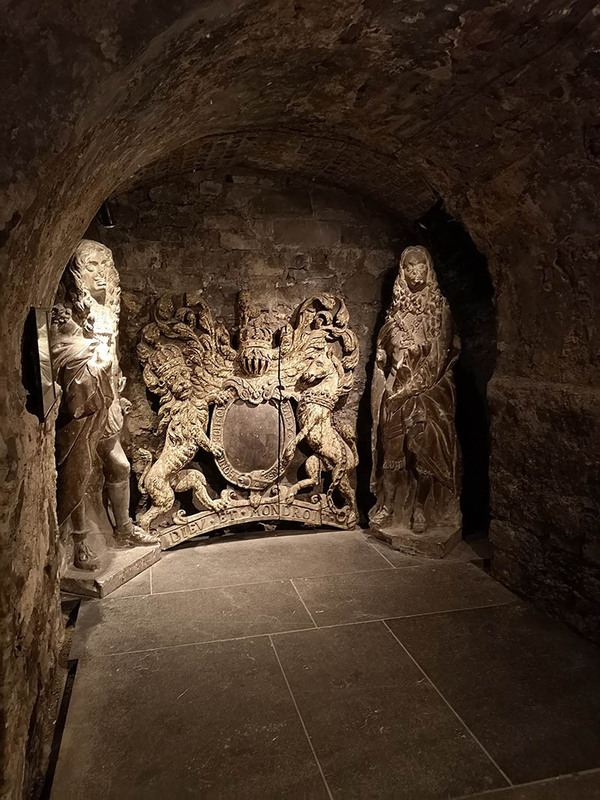 Many historic pieces of stonework and fittings are stored here including the statues from the top of the old Tholsel (city hall) and the stocks. 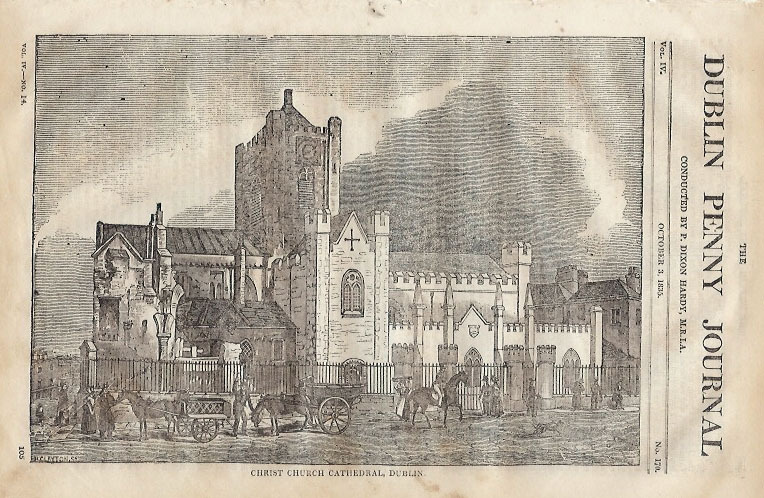 After the demolition of the Tholsel, the statues of Charles I and II and the Stuart Coats-of-arms were moved here. 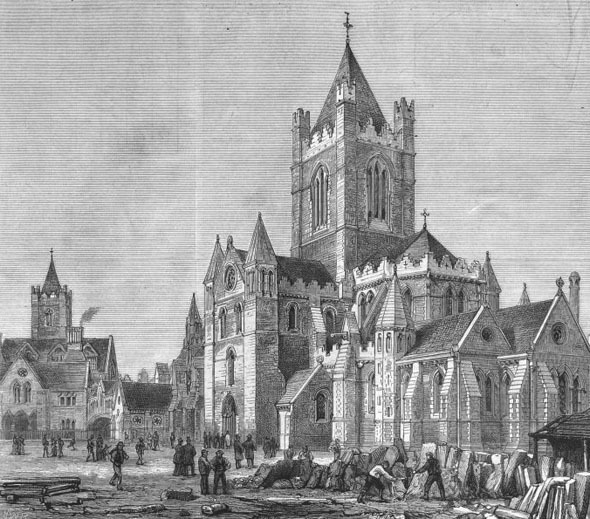 The stocks made in 1670 used to be kept in Christ Church yard but were moved here in 1870. 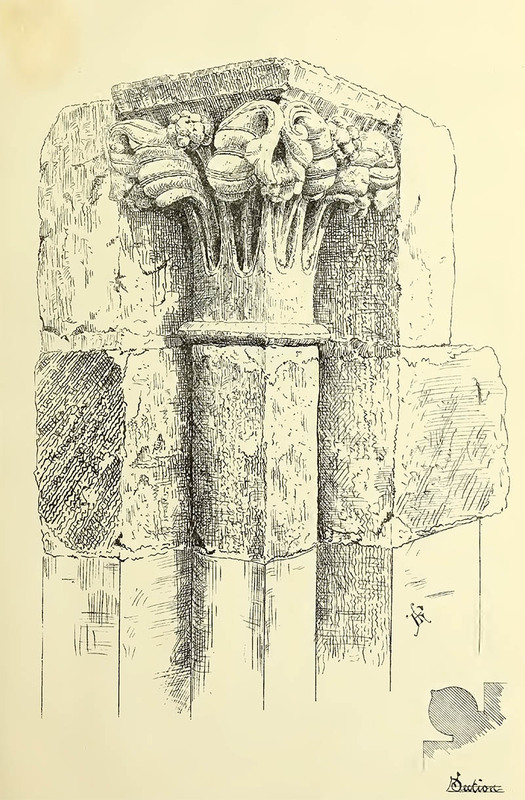 Many pieces of stonework removed and replaced during the ‘restoration’ by George Street including monuments to important families and carved stones from the demolished Long Choir.